The FK Series Polypropylene Butterfly Valves offer superior strength and chemical resistance in highly corrosive environments and process flow conditions. The special trapezoid shape of the liner and a serrated body cavity guarantee a bubble tight seal while keeping break torque at an absolute minimum. This versatile industrial valve features double self-lubricating seals, direct actuator mount capability, or the option of a lever handle or gear box. Shown here, the FK is equipped with pneumatic spring return actuator and explosion proof solenoid valve, making it the ideal choice for use with corrosive media. 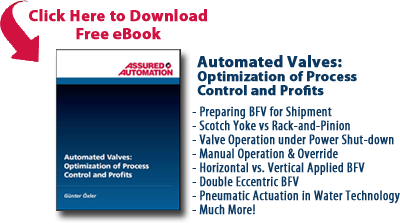 A major soft drink processing plant was seeking to improve the service life and sealing capabilities of the butterfly valves in their water treatment plant. They were using a major manufacturer of resilient seat butterfly valves with ductile iron bodies. The constant exposure to acid and caustic fumes quickly eroded the ductile iron valves, creating a safety issue. These ductile iron valves were replaced every few years. 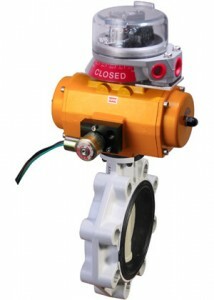 The plant decided to replace the resilient seat butterfly valves with the FK Series butterfly. The valves polypropylene body looks brand new after 3 years of service and the superior body sealing has provided the service life they needed. The maintenance costs were reduced significantly and plant safety has been improved. This entry was posted in Latest News and tagged Butterfly Valves, Pneumatic Actuators, Polypropylene Butterfly Valves. Bookmark the permalink.